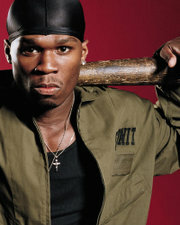 50 Cent (a.k.a. "Fiddy", "Fifty", or "Farari") born Curtis Jackson on July 6, 1975  in Queens, New York), is a popular African American rapper. Before signing to Interscope, 50 Cent was living with his grandparents. He soon became immersed in the drug trade, hustling around his native neighborhood by the name of "Boo Boo" with fellow Queens native Tony Yayo. In June of 1994, Jackson was arrested on felony drug charges. Being a second time offender, Jackson was able to plead out of significant prison time by accepting seven months in a "shock incarceration" boot camp. He would later boast about this period as his doing "seven to nine." He became a father to a son, Marquise, in 1997. 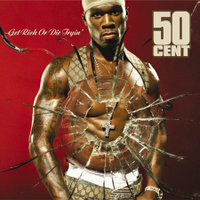 After the success of 50 Cent's Get Rich Or Die Tryin, Interscope granted 50 Cent his own label, like his mentor Eminem. In 2003, G-Unit Records officially came into being. 50 Cent appointed his manager Sha Money XL as the president. In 2003, the label signed on Lloyd Banks, Tony Yayo and Young Buck as the established members of G-Unit. In 2004, The Game, R & B singer Olivia, and DJ Whoo Kid were signed to the label. Recently Spider Loc, Mobb Deep, Mase, and M.O.P. joined G-Unit Records. 50 Cent also scouting gangsta crooner Kokane, Jayo Felony and Lil' Scrappy to join the label. After the release of Beg For Mercy from his group G-Unit, he teamed up with Reebok to release his own G-Unit Sneakers. He also invested in bottled water and his own clothing line. 50 Cent guest starred on an episode of The Simpsons entitled, "Pranksta Rap" on February 13, 2005. 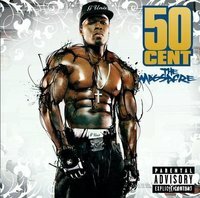 A video game starring 50 Cent, called 50 Cent: Bulletproof, will be availible in 2005. It is published by VU Games. It will be available on the PlayStation 2 and the Xbox, and there is another version in production for the PlayStation Portable. 50 Cent will starring in the semi-autobiographical film called Get Rich or Die Tryin', which will be released November 9, 2005.